We visited the education day on PyconUK again this year (read about last years PyconUK Kids education day). It's a great day for children to get excited about programming and this year electronics as well. Another new feature of this years education track is that the Raspberry Pi education Skycademy team launched high altitude balloons with a Raspberry Pi onboard. My children gave some lego figures that were sent up in one of the flights. This was something that really captured my children's imagination and they have learned so much as a result. 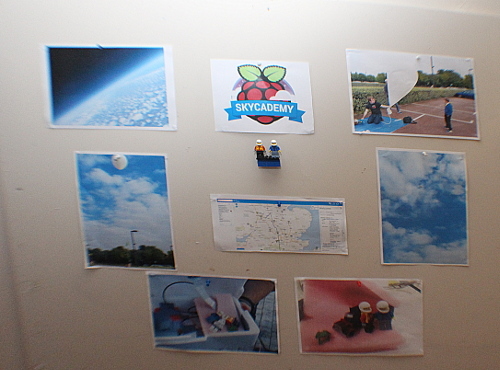 We were already aware about the ballooning since seeing the video of an earlier launch and having listened to David Akerman talk at the Malvern Raspberry Jam, but sending the lego people up in the payload really connected us to the flight. We followed all the tweets on the day. Afterwards we looked at the maps and did some research about how high it went, learned about the stratosphere and why the clouds are at a certain height and lots of other science stuff that we didn't know before (even though I'm a STEM ambassador). We went to watch the second Pycon balloon launch on the Sunday which was great. Although James and Marc were both busy making sure they could launch during their approved window they both explained some of the things they were doing to my children and Marc gave a good explanation of why the weight of the payload was so important (as he topped up the payload with his loose change to add some extra weight). We really enjoyed learning about the flight and watching the launch. They (and I) learned so much from it that they wouldn't have otherwise. A great way to teach about the earths atmosphere.